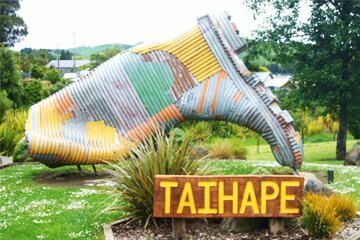 An idea promoted in 1985 has now developed into much more and this aspect of Taihape provides fun, enjoyment, and serious sporting activity, with an annual Gumboot Day, activities around the town and the famous Jeff Thomson gumboot sculpture at the Northern entrance to the town. The evolution of the Gumboot Day promotion came from problems facing small town communities in Rural New Zealand. The Government of the day removed subsidies from agricultural inputs such as fertiliser and drench etc, Agriculture suffered badly with this being felt in town and country alike. Our exports became more competitive but at the same time, incomes were effectively reduced causing a reduction in small town spending. Additionally, the town was also experiencing the down-sizing of New Zealand Railways. The population of Taihape fell from 3500 in the early 1960s to about 1800 in 1985. It was decided to make the most of the busiest traffic day of the year when the shops would also be open. Consequently, Easter Tuesday was selected, Pam Sykes accepted the position of organiser. Tuesday 9 April 1985, The First GUMBOOT DAY was held at Gumboot Park at the northern entrance to the town consisting of gumboot throwing, gumboot races, Fred Dagg look-alikes, decorated gumboots and shop window displays. This provided a day when town and country alike could get together and enjoy themselves while selling the town to the rest of New Zealand. The second GUMBOOT DAY in 1986 provided an opportunity to develop the Taihape University theme. Degrees in “Gumboot Throwology” were awarded by Michael Abraham, the Professor of the University, and Roger Blackiston the Dean. The attempt on the gumboot throwing record has become a fixture for the event. Christine Le Varis coined the term ‘Gumboot Country’ and designed the distinctive logo that has become synonymous with the town and the event. Since 1985 many novel ideas and themes have been explored. The venue has been changed and also the date but overall concepts remain. Taihape GUMBOOT DAY is a well established promotional activity on both local and overseas calendars, providing both family fun and a serious sporting event – the North Island Boot Throwing Championships. 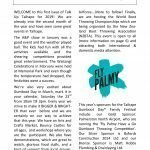 Next Gumboot Day in Taihape – March 23rd 2019 featuring the IBTA World Gumboot Throwing Championships in Taihape! In 1997 Jeff Thomson had a chance meeting with Taihape’s Brown Sugar owners Lee & Charlotte, resulting in sketches on a serviette of a thrown gumboot being passed on to the Gumboot Country Promotions Inc (GCP) co-ordinator, Jan Byford. 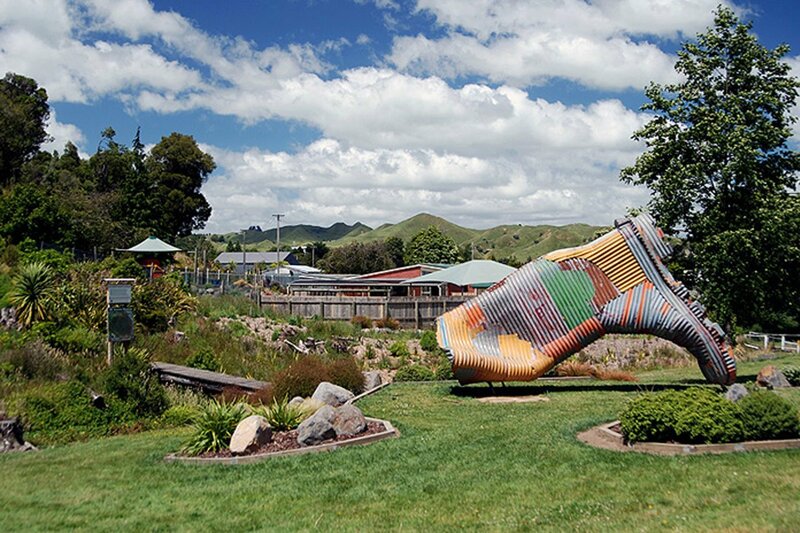 After much discussion with the GCP committee and consultation with Jeff, he was commissioned to build the gumboot as a celebration of the millennium and to identify Taihape’s icon in the most appropriate rural art medium, corrugated iron. Sponsorship was granted by PowercoTrust & Byfords Construction along with other local businesses and Gumboot Day profits. Jeff used the Byford Construction yard as the building site, completing this icon for Taihape in August 2000. The Gumboot was placed in the Outback initially, and with the construction of the new toilet block, the relocation of the Gumboot to SH1 was essential and timely. It was vital to ensure that this high profile art piece was sited in the best position considering the right elevation and most fitting surrounds. In 2015, the Meet n Greet Group added the ‘Taihape’ sign in front of the gumboot so that photographers can always remember where the gumboot is! With the Council’s policy for public artworks, the Gumboot sits under Council’s long term care and maintenance. To date the Gumboot has interested and intrigued the public from all over the world. It is photographed, climbed on, sat on and touched by many and now, being at the more accessible site will continue to provide much interest to SH1 traffic.